File photo of a Lloyds Pharmacy in England. 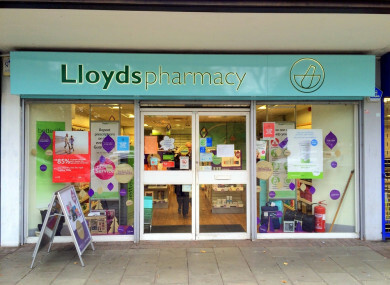 A SECOND DAY of strike action is set to take place at 34 Lloyds Pharmacy outlets around the country tomorrow in a row over pay. Trade union Mandate has accused the company of utilising zero-hours contracts. Lloyds itself put out a statement earlier accusing the union of misleading the media saying “we do not have, and never had, zero-hour contracts”. All part-time workers were given notice of working hours six weeks in advance, the company said, and the contracts they were on were aligned to the needs of the business. A union spokesperson said, however, that the company was misleading the media. “We have members coming to us and showing us their contracts today, some of whom have been employed in recent weeks, and they are clearly zero hour contracts,” Gerry Light, Mandate Assistant General Secretary, said. Light said the union represented a third of all workers at Lloyds, with over 220 members. The company said only 13% of employees had been balloted ahead of the strike action. An initial day of action targeting the pharmacy chain was held earlier this month. The dispute arose after the retailer rejected a recommendation from the Labour Court that it negotiate with Mandate over pay conditions. Email “Pickets to be placed at 34 branches of Lloyds Pharmacy tomorrow ”. Feedback on “Pickets to be placed at 34 branches of Lloyds Pharmacy tomorrow ”.